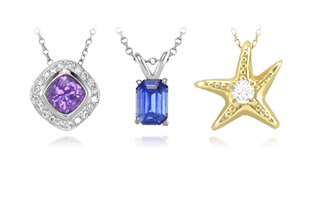 Many standout jewelry styles are representative of vintage jewelry and so they remain very popular today. An Art Deco diamond and platinum collar necklace. 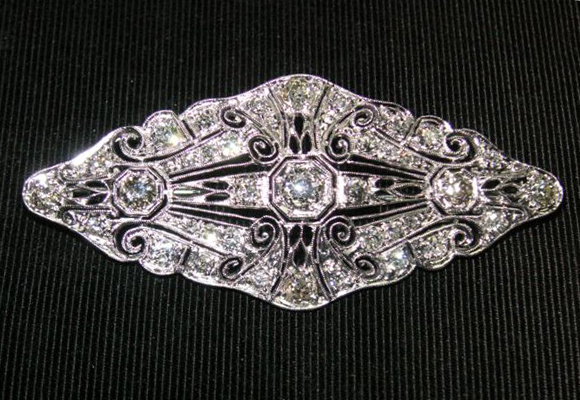 A diamond and platinum Edwardian brooch. Queen Victoria’s successor, King Edward VII, inherited an empire at the peak of its power and influence. Edwardian England gave birth to a distinct and influential jewelry style that was popular from about 1901 to 1920. Edward VII and his wife, Alexandria, brought a new sophistication to the fashions of the period. Both the King and Queen set the tone for what is called the Belle Epoque , a time when both dress and ornament were extremely elegant and constructed with only the finest materials. 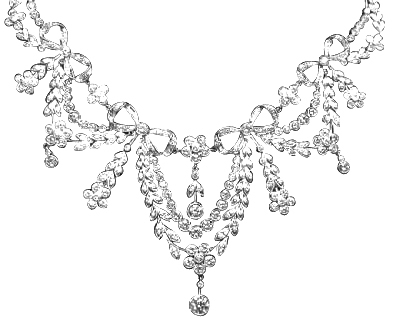 An Edwardian platinum and diamond garland necklace. Edwardian jewelry owes much of its character to platinum, a rare and unusually strong metal that entered the jewelry trade at the end of the 19th century. Although the Spanish recovered platinum from South America during the 16th century, it was nearly two hundred years later that metalworkers mastered the techniques for refining and casting it. Once they did, jewelers were quick to exploit platinum’s unique properties. 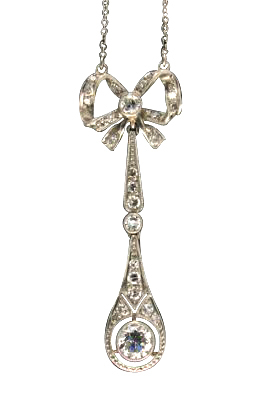 A lacy Edwardian diamond drop pendant. Platinum’s tremendous strength allows it to endure wear even when it is drawn into a thin wire and slender shapes. 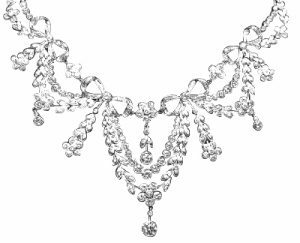 Fine mesh, dainty garlands, and satiny ribbons, all so delicate they would collapse like wax if they’d been cast in gold, became a trademark of Edwardian jewelry. Edwardian designers adopted a clean, light style that made ample use of classical motifs borrowed from Greece and Rome. An Edwardian platinum and diamond brooch with a peridot center stone. With a huge influx of diamonds coming from newly discovered South African deposits, Edwardian jewelers enhanced their pieces with many small diamonds. 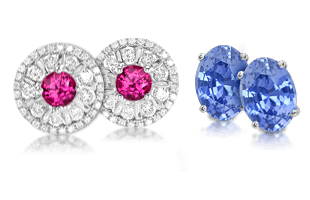 Diamonds and platinum also offered a pleasing backdrop for pearls and other fine gemstones including rubies, emeralds, and sapphires. 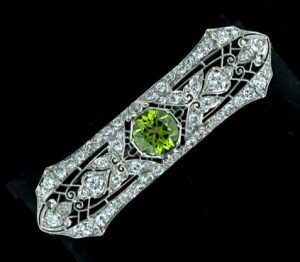 King Edward helped make his good luck stone, the peridot, very popular. 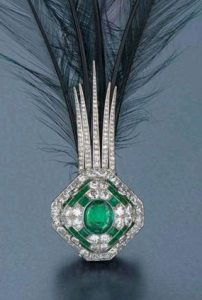 A diamond, emerald, and feather aigrette from Cartier. After the royal couple visited India, exotic influences also permeated jewelry fashion and women began to wear platinum and diamond aigrettes , sautoirs , lavaliers , and “ dog collars s” or chokers. Chandelier earrings, brooches, and other jewels for the hair were also popular. There was also renewed interest in men’s jewelry. 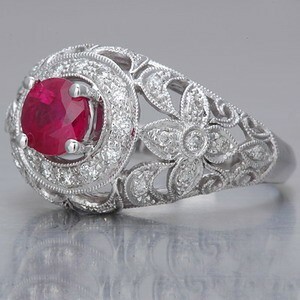 An Edwardian style ruby and platinum engagement ring. 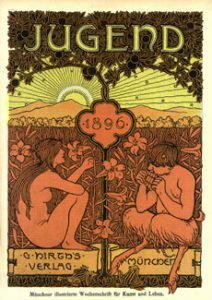 The Edwardian design aesthetic coincided with, and was influenced by, the Art Nouveau movement that was spreading across Europe. 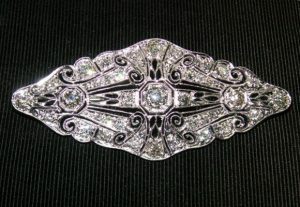 Many however, believe that the elegance, beauty, and superb craftsmanship of Edwardian jewelry are second to none. While authentic Edwardian jewelry is costly at auction, the style is frequently imitated in modern jewelry fashions. Today, lacy diamond engagement rings from the period are very popular. 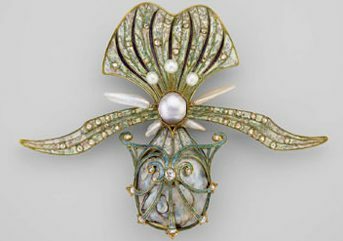 “The Three Crabs” brooch by Georges Fouquet c. 1900. Gold with plique-a-jour enamel, pearls, and diamonds. While Edwardian jewelry flourished in England, continental Europe created a family of styles that are particularly popular with today’s jewelry collectors. These styles were known as Art Nouveau in France and Jugendstil in German-speaking countries. 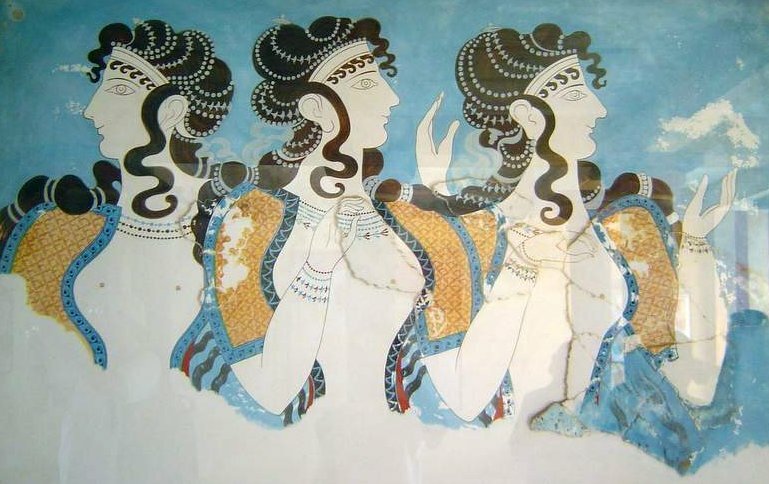 This stylistic movement in art, architecture, and the decorative arts peaked in popularity between 1890 and 1919. This front cover of an 1896 edition of the German magazine Jugend (“youth”) is decorated in Art Nouveau motifs. 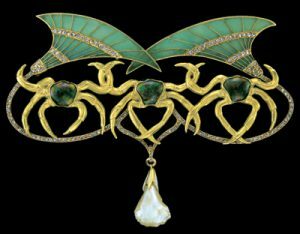 In a rejection of machine-made, mass-produced jewelry, the Art Nouveau movement embraced and exalted natural and free-flowing forms in its jewelry. Originality and excellence of design were prized far beyond the intrinsic value of the materials. Art Nouveau jewelry was elevated as an art form, incorporating sculptural elements and colorful palettes like those used by a painter. The Great Wave off Kanagawa is Hokusai’s most famous woodcut print. 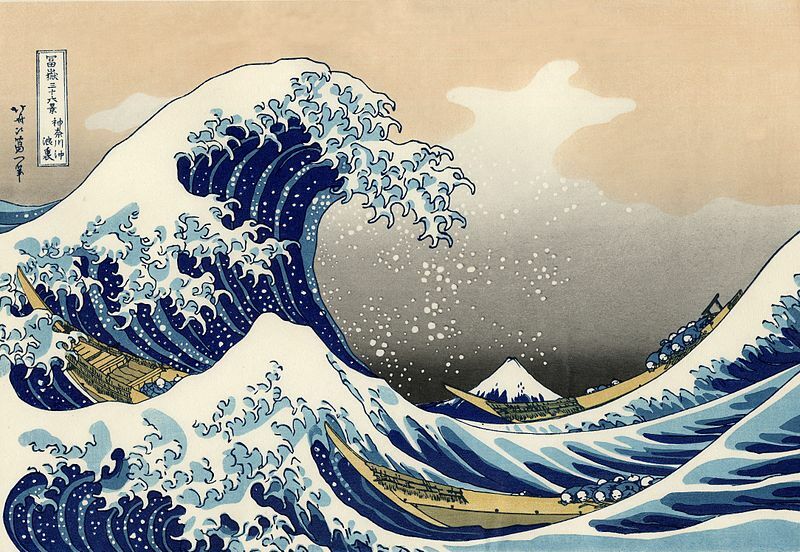 Japanese woodcuts had a strong effect on the development of the Art Nouveau style. Floral motifs were borrowed from the Arts and Crafts Movement of the late Victorians. Nevertheless, Art Nouveau was the sum of the work of many distinct individuals including Gustav Klimt, Charles Rennie Mackintosh, Alfons Mucha, Aubrey Beardsley, René Lalique, Antoni Gaudí, Louis Comfort Tiffany, Georges Fouquet, Lucien Gaillard and Georg Jensen, who each interpreted it in their own unique manner and materials. Orchid brooch by Georges Fouquet. Instead of the prim ribbons and garlands of Edwardian England, the continental styles featured free flowing asymmetrical lines and organic themes. Subjects from nature were especially popular, and turn-of-the-century jewelry often featured delicately rendered nymphs, flowers, insects, fish, lizards, snakes, and birds. 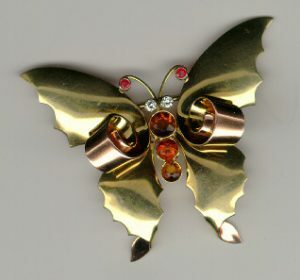 Lucien Gaillard’s Moth Pendant, ca. 1900. Gold, enamel, citrine, and horn. The jeweler was now an artist as well as a skilled craftsman. Faceted, carved, and cabochon -cut stones were set in complex metal settings and often decorated with fine enamel. A variety of enamel techniques were used including basse-taille, champleve, cloisonné, and plique a jour. The female form also became an often present element, echoing the natural and sculptural themes. 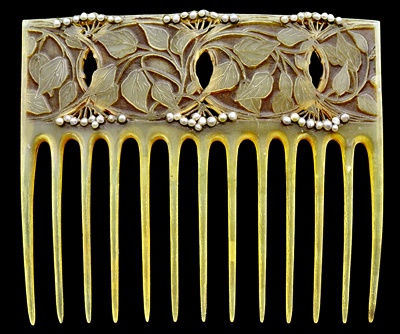 A carved horn and seed pearl hair comb by Vever. Unusual gemstones were incorporated into jewelry including amber, opals, moonstones, citrines, and peridots. Other uncommon materials included materials such as horn, copper, tortoise-shell, ivory, carved glass, and shells. The goal was always for a lifelike representation of the materials, so the use of any element was deliberate and thoughtful. A Tiffany Art Deco emerald and diamond bracelet. The term “Art Deco” stems from the Exposition Internationale des Arts Décoratifs, held in Paris in 1925. The Paris exhibition, which included furniture, interiors, household objects, and jewelry, introduced the world to a radical new “modern” style. 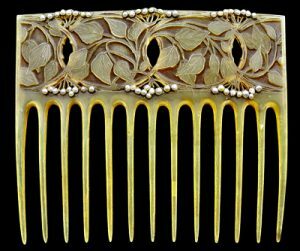 Gone was the delicate filigree work of Edwardian jewelry and the whimsical animals and tendrils of Art Nouveau. Art Deco necklace made of chrome and galalith, a kind of plastic. In their place came bold, contrasting colors, broad fields of glittering diamonds, and strong geometry that reflected the exuberant energy of the machine age. 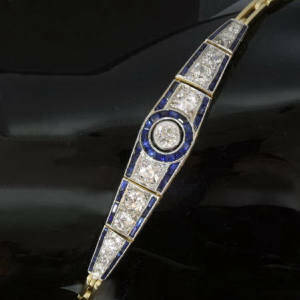 Yet for all its celebrated modernity, Art Deco jewelry borrowed freely from ancient jewelry traditions around the world. Chinese, Egyptian, and African motifs were frequently reinterpreted in modern materials. Tutti frutti Mauboussin lapel watch. The Art Deco style also borrowed from the other modernist movements of the time, such as Bauhaus, Cubism, Empire Neoclassicism, Futurism, and Modernism. The movement was originally referred to as “Style Moderne,” and it wasn’t until the 1960s that the term “Art Deco” was first used in retrospect. 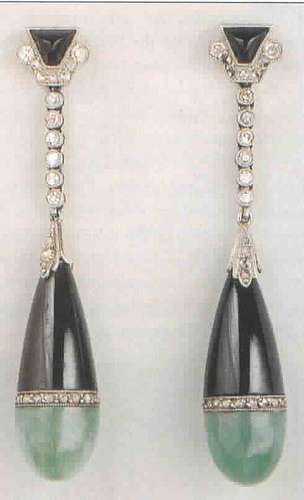 Boucheron earrings made of diamonds, jadeite, and onyx. During what we now refer to as the Art Deco period, emphasis shifted from pastel colors and flowing lines to bold, bright colors and straight lines. Women cut their hair into short “bobs.” This was the era of Jazz and flappers. Art Deco jewelry was designed to complement the flamboyant and playful fashions of the day. Deco bracelet made of platinum, diamonds, and sapphires. 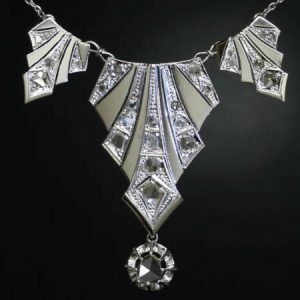 Art Deco jewelry was aggressively modern, but its up-to-date techniques and aesthetics also combined unfettered imagination with exquisite craftsmanship. It is no wonder that Art Deco jewels are still considered icons of the jeweler’s art. Grand jewelry houses including Cartier, Mauboussin, Boucheron, and Van Cleef and Arpels cemented their reputations with Art Deco pieces. 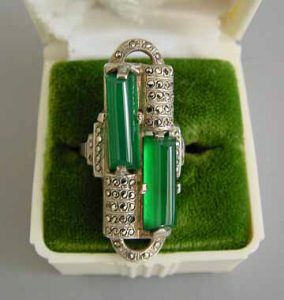 Art Deco chrysoprase and marcasite ring. Art Deco designers used the undiluted blue, green, and red of sapphires, emeralds, and rubies against platinum settings or black enamel. 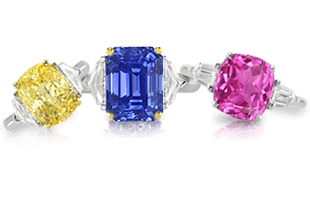 These color combinations were a favorite of Cartier, and jewels with precious gemstones carved into the shape of fruits and leaves were called “tutti frutti” jewelry. 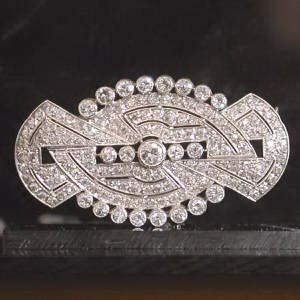 A brooch with Art Deco design and perfect symmetry. 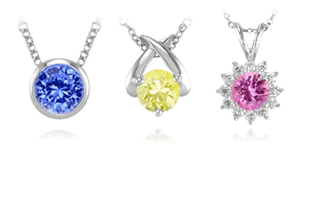 New geometric gemstone cuts were developed to complement the symmetry and streamlined look of Art Deco jewelry. Modern materials were also introduced to the jewelry industry, including plastics, chrome, and aluminum to be seamlessly integrated with the classic materials for a truly modern take on jewelry. 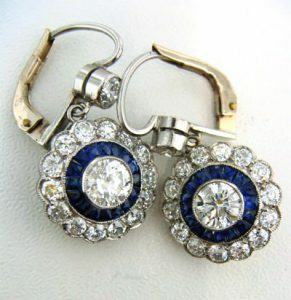 A pair of sapphire and diamond Art Deco earrings. Long dangling earrings were popular, along with cuff bracelets, intricate platinum-set rings, and necklaces and pendants of all sizes. 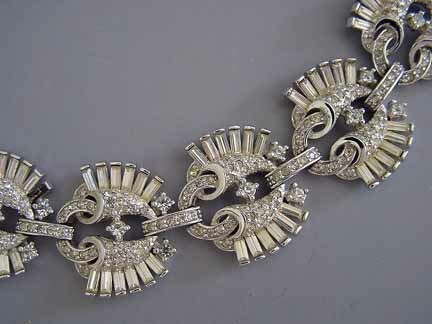 Two types of jewelry belong especially to the Art Deco style: the double clip and the sautoir. The Art Deco style prevailed from the mid 1920s through the mid 1930s. 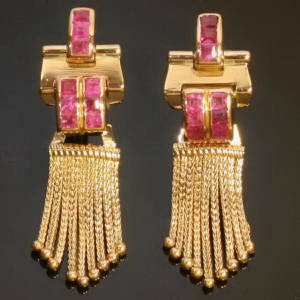 A pair of retro gold and ruby earrings. 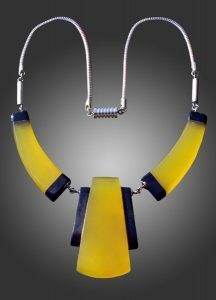 Over the course of the turbulent 1930s, Art Deco transformed into a style now called “Retro.” The bold geometry introduced in Art Deco jewelry persisted, but in a more massive metallic incarnation. 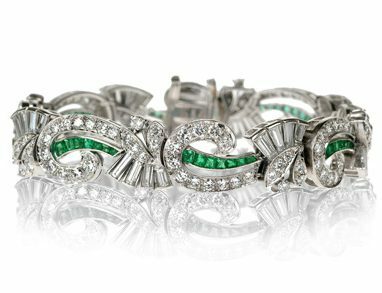 Art Deco jewelry was heavily studded with diamonds and colored stones, but metal dominates in the jewelry of the Retro period. A retro diamond and white gold bracelet. 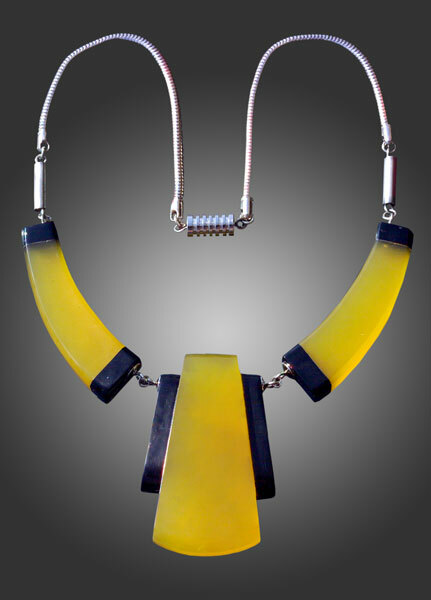 Retro jewelry features broad curved, rolling, or scrolled surfaces and blocky shapes rendered in glossy metals. Retro jewelry designs were inspired by mechanical objects such as bicycle chains, engines, and padlocks. Bullet shapes, fat ribbons, and cylinders are also common motifs. 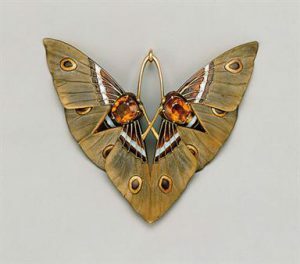 A retro butterfly brooch by Tiffany and Co. 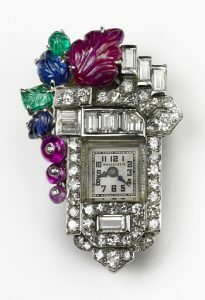 The Retro jewelry period began in the 1930s and lasted until about 1950. Jewelry from this period showcased either small natural gemstones, which were very expensive at the time, or large synthetic gemstones in oversized, rectangular cuts. Aquamarine, topaz, citrine, emerald, and ruby were all popular gemstones. Gold was used extensively in designs of the Retro period, since platinum supplies were siphoned off for the war effort. Pink gold’s coppery hue is still linked with the Retro style in the public’s imagination. 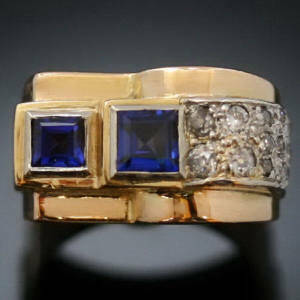 A retro style ring with sapphires and diamonds. Popular jewelry designs during the Retro period included chunky cocktail rings, necklaces, and charm bracelets. Retro styles have become popular again in recent decades for both costume and fine jewelry wearers and collectors. Large cocktail rings , or right-hand rings, as well as charm bracelets have had a 21st century resurgence in jewelry trends. Continuing on the journey through jewelry periods, learn about Contemporary Jewelry | An Overview of Techniques, Designs, and Settings next.